The Arte kitchen project is a design made to ensure maximum efficiency of spaces and services. A project that comes from the concept that the kitchen area is a special place where you are using and transforming the elements of nature: water, fire, air and earth. 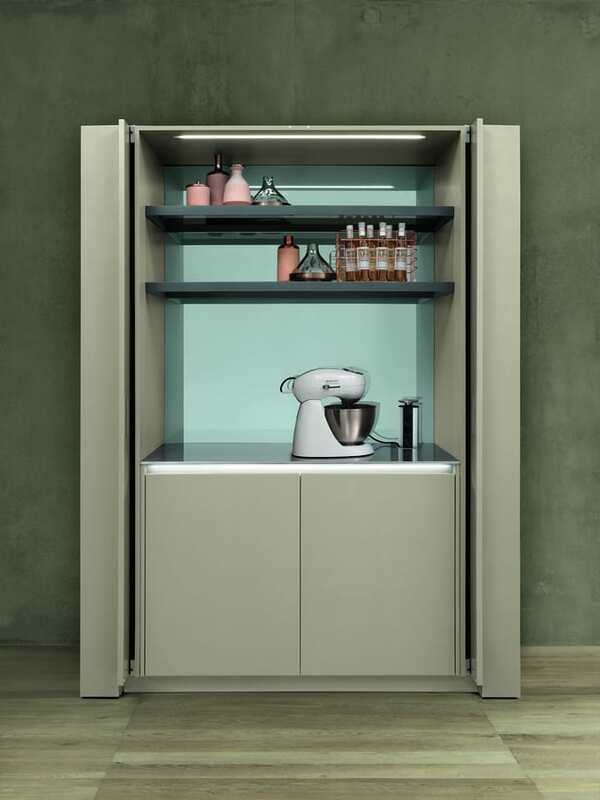 The technical elements of the kitchen project like taps and hoods, can disappear and appear, thanks to a mechanical system that aims to give an absolute sense of elegance. Even the gestures a person does to activate the many functions of Arte, have been carefully calculated, in order to minimize the movements necessary during the preparation of food. Arte, designed by Marco Piva for Gruppo Euromobil can be mainly characterized by an extreme modularity and the ability to adapt to the needs of users. The kitchen is set up as a large portal that can be configured in countless different ways, flanked by two supports equipped with containers. Always seeing himself as an innovator, Piva wanted to reinterpret the kitchen in a very practical way and in line with the latest trends. For this reason the design is able not only to be merged in the style of your interior, dressed with fine finishes and various color options, but also to transform into something different. The Arte kitchen project is a formal kitchen that has the versatility and ability to integrate with the spaces and can be broken down into much smaller elements to form specialized containers: a small bar, a small wine bar, a showcase or a library. At the same time is fitted with highly efficient equipment that is available at all times, without being aesthetically intrusive. Euromobil’s idea has always been that everyone should have the opportunity to create a place that reflects their taste, lifestyle and personal idea of beauty, therefore they don’t produce “mass” furniture but only modular pieces that can be always customized for every need of their clients, and this concept is clearly reflected by Arte.